Cream the butter and sugar together until the mixture is light and fluffy, then beat in the maple syrup. Beat the eggs together and gradually add a little egg to the butter and sugar mixture, beating well in between. The mixture should stay smooth until all the egg has been added. Sift the salt and flour into the butter mixture and fold in lightly. When it is almost completely folded in, add the milk and the bacon bits. Fill approximately 16 cupcake cases ⅔ of the way. Place in the pre-heated oven and reduce the temperature to 180˚C. Bake for 15 minutes or until golden. In a medium bowl, beat the cream cheese and the butter together until smooth. Mix in the maple syrup and then gradually add the icing sugar. Fry the diced bacon until crispy and leave to cool. 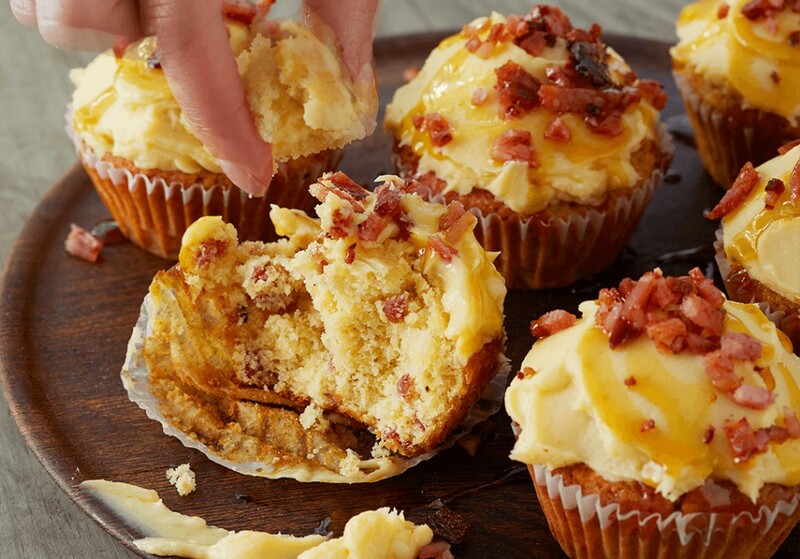 Spread the icing onto the cooled cupcakes and top with the crispy bacon bits. Drizzle with maple syrup.